NORTHRIDGE, California - Founded in 2005, the Houston Dynamo is a professional soccer team that competes in Major League Soccer (MLS). After playing its first few seasons at the University of Houston's Robertson Stadium, the team needed a home of its own and will be moving to the newly completed BBVA Compass Stadium on May 12, 2012. The 30,000-seat stadium will offer the latest in facilities and amenities-including a HARMAN sound system that boasts more than 200 JBL loudspeakers, 50 Crown amplifiers and an extensive BSS Audio distribution and control system. Wrightson, Johnson, Haddon and Williams, Inc. of Dallas, TX handled the audio system design, led by Senior Associate Gary White. Ford AV of Oklahoma City, Oklahoma was the audio/video contractor for the project. The loudspeaker complement for BBVA Compass Stadium main bowl includes a combination of 90 JBL AE Series and PD Series speakers. Models include JBL's AM7215/95-WRX and AM7215/26-WRX full-range 2-way 15-inch speakers, and PD5212/95-WRX and PD5212/64-WRX 2-way 12-inch high-output speakers. All of the speakers have JBL's WRX extreme weather protection treatment and are used in the main seating bowl of the stadium. 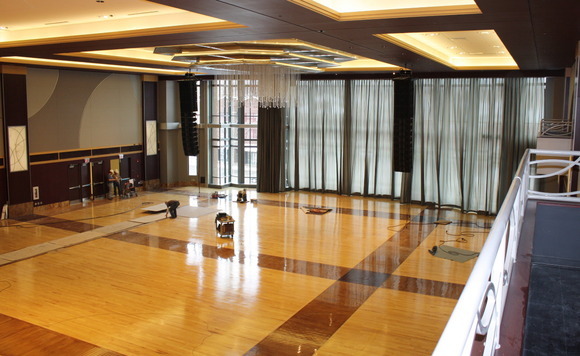 In addition, 113 JBL Control(r) Contractor speakers are installed throughout the facility, including the Control 26CT and 24CT in-ceiling speakers and Control 25T and 28T-60 indoor/outdoor speakers, along with a pair of JRX112M monitors. The speakers are powered by 45 Crown CTs Series CTs-3000-LITE and seven CTs-2000-LITE amplifiers. The audio system is networked together by an extensive complement of BSS Audio Soundweb London components, including 16 BLU-800 devices with CobraNet(tm), three BLU-160 devices, three BLU-120 I/O expansion devices, a BLU-80 device with CobraNet, seven 9015US Wall Panels, 12 BLUCARD-IN input cards and 29 BLUCARD-OUT output cards. "BBVA Compass Stadium required a multi-purpose sound system that could handle public address and music throughout the facility," noted Gary White. "We've had great success with HARMAN products in the past and AEG (Anschutz Entertainment Group), one of the major promoters of Major League Soccer, has a partnership with HARMAN so it was a good fit all around." The stadium's audio system has numerous zones including the main bowl area, the entrances, 34 private suites, the restrooms and other locations. In addition, separate dedicated sound systems are installed in the stadium's Premium Club, the press room and the post-game interview room. "The BSS Soundweb London components were absolutely essential in getting all of the different audio signals properly routed to all these diverse areas," White pointed out. "They make what could have been an overly complex system extremely manageable." "The JBL AM7215 and PD5212 models are ideal for the main stadium area," said White. "They deliver high SPL and their rotatable waveguides enable optimum positioning and the ability to orient the speakers either horizontally or vertically. They are also weatherproofed and durable, which is almost as important a consideration as their sound quality and coverage pattern in a city like Houston with its extremes of weather and temperature." Jason Werle, Project Manager for Ford AV's Dallas Division explained some of the challenges behind this installation. "In order to meet a deadline of when the lifts were no longer [allowed] on the field, our first task was to install all of the bowl speakers. At the time, the field was highly populated and made it challenging to navigate around the bowl. We installed all these speakers from the field level using an articulating boom and chain hoists. Any project of this size will have difficult cable pulls and Dynamo was no exception." "We went with the JBL Control in-ceiling and outdoor speakers in the other areas of BBVA Compass Stadium because they are compact and can be installed inconspicuously, yet deliver powerful sound," noted White.